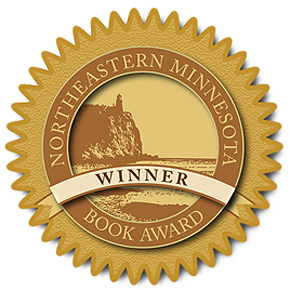 DULUTH, MN – This year marks the 27th annual Northeastern Minnesota Book Awards (NEMBA). The event, which is free and open to the public, will be held on Thurs., May 21, in the Kirby Ballroom on the campus of the University of Minnesota Duluth. Reservations are not required. Festivities begin at 5 pm with a book fair and refreshments. Guests will enjoy pie from the Rustic Inn and harp music by Georganne Hunter. At 6:30 pm, Jim Johnson, 2014–2016 Poet Laureate of Duluth, will give the keynote address followed by the award presentations, hosted by Barton Sutter, Duluth's first poet laureate. Following the awards, the book fair continues until 9 pm. Awards are given in six categories: (1) fiction, (2) poetry, (3) general nonfiction, (4) memoir/creative nonfiction, (5) children's literature, and (6) art, photography. The winner of each category receives a cash prize of $200, and the winning author and the honorable mention in each category receives a glass plaque and 100 complimentary NEMBA book seals. NEMBA is a free community event sponsored by the Kathryn A. Martin Library at UMD with financial support from Friends of the Duluth Public Library and Lake Superior Writers. For more information, visit the UMD Library/NEMBA website. Jim Johnson has published seven books of poetry. His most recent collection, The First Day of Spring in Northern Minnesota, was a Minnesota Book Award Finalist and winner in the poetry category of the 25th annual Northeastern Minnesota Book Awards. Much of his poetry focuses on the lives of northern Minnesota's Finnish settlers, translating the experiences of these immigrants into universal themes of hard work, nature, and families. Johnson also served as Duluth's poet laureate from 2008–2010. On Thurs., May 21, from 1–3 pm, Jim Johnson will lead a writing workshop entitled "Feelings, Images, and Poetry." It is offered through Lake Superior Writers (LSW). It will be held in the Kathryn A. Martin Library Rotunda. Cost (payable at the workshop to Lake Superior Writers) is $25 for members or $40 for non members, which includes membership in LSW. Register via email at writers@lakesuperiorwriters.org or call Marty Sozansky at 218-341-4363. Each year, NEMBA recognizes books that best represent northeastern Minnesota in the areas of history, culture, heritage, or lifestyle. This year, 39 books published in 2014 have been nominated. Incident at the Bruce Mine Shaft, Stephen M. Ivancic, Monarch Tree Publishing, Inc.
Plover Landing, Marie Zhuikov, North Star Press of St. Cloud, Inc.
A River Through Two Harbors, Dennis Herschbach, North Star Press of St. Cloud, Inc.
Voice Lessons: Tales of Breaking Free, Catherine Holm, North Star Press of St. Cloud, Inc. Waters Like the Sky: Book 1 – The Chronicles of an Unlikely Voyageur, Agnes Rajala and Nikki Rajala, North Star Press of St. Cloud, Inc.
Minnesota’s Lost Towns: Northern Edition, Rhonda Fochs, North Star Press of St. Cloud, Inc. Rooted in Iron and Ice: Innocent Years on the Mesabi, Gary W. Barfknecht, North Star Press of St. Cloud, Inc.
A Bird on My Hand, Mary Bevis, illustrated by Consie Powell, Raven Productions, Inc.
Full Wolf Moon: A Lunar Calendar of the Anishinabe, Cheryl Weibye Wilke, illustrated by Ernest Gillman, McDonald & Woodward Publishing Co. The Map Maker’s Quest, Matthew J. Krengel, North Star Press of St. Cloud, Inc.
Searching for Raven, Jerry Hines, North Star Press of St. Cloud, Inc.
Wilder’s Foe, Diane Bradley, North Star Press of St. Cloud, Inc.